Welcome to the Home of Northeast Michigan's Finest Seawalls, Decks, & More. Shoreline Contracting, a fully licensed and insured company, prides itself in designing seawalls to specifically meet your needs. Our hand picked crew pays attention to detail, creating the best appearance and effectiveness of our products. Whether it be pole walls, steel, cribs, etc. 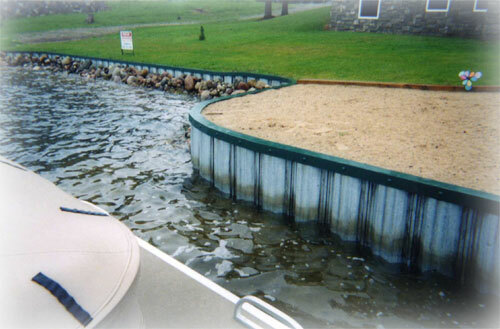 you can count on walls installed which are proven to withstand Michigan's elements on Lake Huron as well as all of our surrounding inland lakes. Geographics Proudly serving Iosco, Alcona, Ogemaw, and Arenac counties. Seawalls and Your Lake An eroding shoreline can be a big headache for lakeshore homeowners. After all, you’ve spent a premium for your lakefront property and you’d like to keep it in place. What can you do? More importantly, what can you do without adversely affecting your lake and your property value? The objective of lake shoreline protection techniques is to stabilize and protect these land forms against scour and erosion from forces such as wave action, ice action, seepage, and runoff from upland areas. The Solution: Seawalls. Seawalls by Definition Seawalls are rigid structures that do not move when waves strike them. Wave energy instead is reflected back into the lake and down along the shore. They are used where steep banks prohibit the forms of protection suitable on shallow slopes. The seawall is placed vertically in soils and forms a barrier between the land surface and the water. The seawall itself can be constructed of sheet pile, wood, or concrete. Proper seawall construction requires: (a) anchoring either by driving the pile deep into the ground or the placement of “deadman” anchors and (b) protecting the “toe” of the seawall with large stones to prevent undercutting. Seawalls not properly constructed may quickly begin leaning toward the water due to back-pressure making it important that they are done by a professional.